There is one post tagged mac. I was having tremendously high CPU issues with my Mac last week. 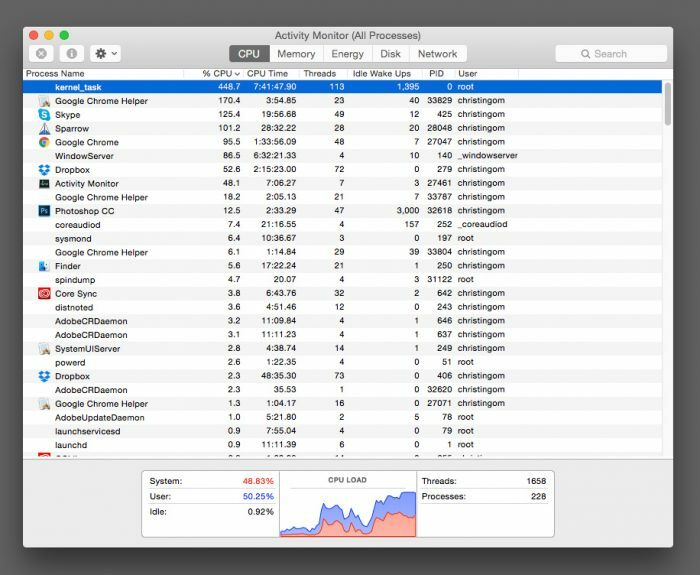 So high, that I could barely watch a video without my kernal_task blooming to over 400 % CPU! It was difficult to get work done at times, due to the problem. It confounded me for a while, and I tried searching online for resolutions and they were all useless. I finally set up an appointment at the Apple Store to get an analysis. I figured maybe my battery or my memory was going bad. Turns out, the scan of my hardware came back perfect (which made me happy). They then offered to reinstall the OS for me, and I had them reinstall Yosemite (no data loss, even though I was backed up). Sure, I could’ve done this on my own, but I kind of thought they might be able to do it faster and find other problems. Thankfully, the reinstall solved all of the issues! Now, my kernal_task hovers around 4-5%, even when I’m watching movies. My CPU usage is low, and instead of the computer fan blowing non-stop, it’s silent again! Update: So the issue completely goes away if I only have 1 external monitor plugged into my Macbook Pro. If I use both external monitors, my computer is completely sluggish — moral of the story, I’ve been using 1 external monitor lately. I am planning to just get a new Macbook Pro fairly soon, so problem will be solved with more RAM.